Here are my comments on the controversy behind Annie Jacobsen’s fascinating and provocative book which was written in 2011. But before you read my comments (which is located near the end of this blog), let me clarify something. First of all, it is so unfortunate that the first and practically the only thing the vast majority of the readers of this 500-page book talk about is what is included in the last 8 pages in which Jacobsen simply quotes from an ‘anonymous’ E.G. & G. employee (who happened to be only one of close to a hundred former employees that she interviewed) who apparently told her his ridiculous claim that the Roswell “crash” of 1947 was an intentional act by Stalin’s Soviet Union which flew a Nazi flying wing aircraft from Russia and crashed it over New Mexico, with deformed, genetically experimented small humans on board that the Nazis had created. Annie Jacobsen herself had never made such a ridiculous assertion. She was simply quoting from her “anonymous” former E.G. & G. employee (who later turned out to be Alfred O’Donnell who had joined the defense contractor in 1947 when it was established. Apparently it was disinformation that O’Donnell provided to her. Jacobsen also knew it was disinformation, but nevertheless included it in her book because of its sensational value. Was it “counter” disinformation over intended disinformation on the part of Alfred O’Donnell? Whatever the case may be, it had become (intentionally or not) a brilliant marketing strategy for her book!! Annie Jacobsen’s book is well written, riveting and thought-provoking!! Did she intentionally allow many gullible reviewers (even a few military aviation enthusiasts who fell into this entrapment) to exclusively focus on the controversy…. (i.e., the last 8 pages which have little to do with the rest of her thick and rather straightforward book) ? Indeed it seems that most reviewers (including a New York Times reviewer, and even L.A. Times itself) were sidetracked by this provocative item and unwittingly played a role in sensationalizing her book. Her ‘anonymous’ interviewee (no longer anonymous, as I stated…Alfred O’Donnell of E.G. & G.) may also have fallen for the trap by agreeing to throw in an obvious piece of disinformation (which he may well have been aware of, as well as Jacobsen herself….as disinformation) for her book. The strategy seemed to have worked and the book became a top-seller. * The book definitely brings up a very important topic, i.e., the significance of Operation Paperclip that played a major role in the subsequent development of America’s Black Budget programs. It has always been my understanding that in 1945, immediately after the end of World War II, the U.S. brought in many German scientists and engineers (as well as some former SS intelligence officers) to New Mexico through that program. After arriving at Wright Patterson Army Air Field in Ohio, it is said that many were then transferred and initially stationed at Albuquerque’s Kirtland Army Air Field (present Kirtland AFB) and Ft. Bliss, Texas. Some of the scientists and engineers were then relocated to Los Alamos. Others were transferred to White Sands Missile Ranges. Many of the German engineers played some significant roles in the development and testing of U.S. rocketry (as well as other military projects) in the late 1940’s. 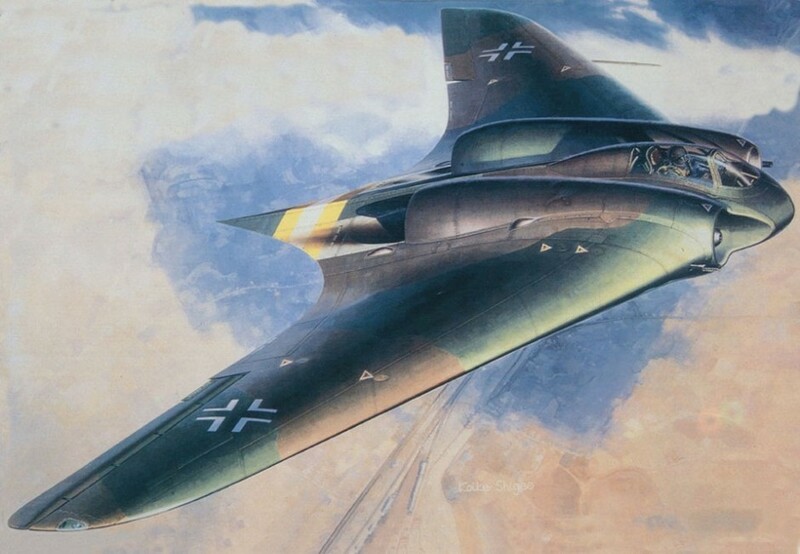 It has always been my understanding that the U.S. military also secretly began to test-fly several prototypes of unconventional, flying wing aircraft (some with Ramjet engines) which the Germans developed in the early 1940’s, including a few of the Horten brothers’ flying wings. 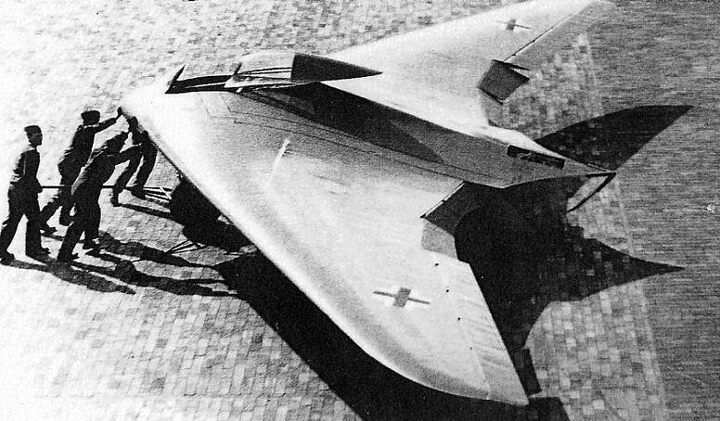 It is said that one of the Horten brothers’ fying wing aircraft may even have reached speeds of up to 500 miles per hour when tested in Germany in 1943, even though it had a limited range of less than 1000 miles. With the help of these scientists and engineers, it is my conjecture that the U.S. military secretly conducted these flight tests over the deserts of southern New Mexico and elsewhere. Other flight tests may also have been conducted in wide areas in the Western states, extending from Washington all the way to Texas. 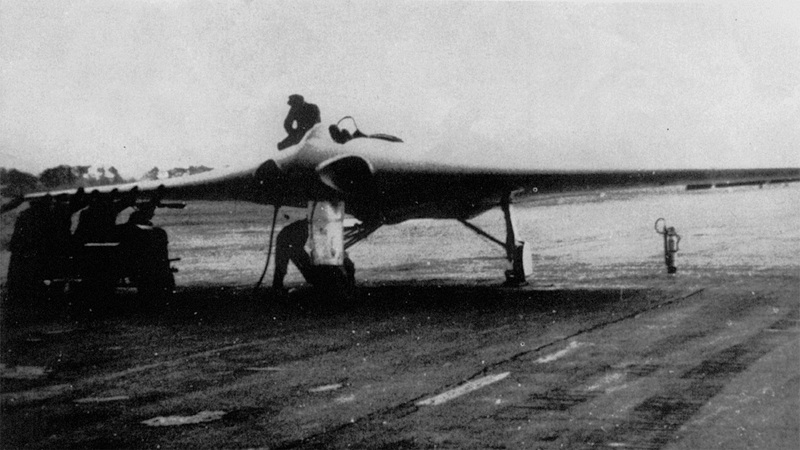 Some of these prototypes of flying wing aircraft were crescent-shaped. Some others were delta-shaped or manta ray-shaped. It is very possible that accidental crashes of some of these craft may have necessitated the creation (and even “staging”) of convenient “cover stories”. Therefore it is my personal belief that it was the U.S., and not Stalin and the Soviets, that acquired several of the most technologically significant flying wing prototypes (and information pertaining to that technology). Stalin and the Soviets, no doubt, also got hold of many German scientists and engineers through their own “version” of Paperclip but it was at one time my conjecture that what may have possibly crashed accidentally in New Mexico was not from Soviet Russia. If it indeed (the big If) had accidentally crashed, it was most likely of German origin, acquired, modified and developed further by the U.S. and test-flown by the U.S. within New Mexico. And this, I believe is the crux of the so-called ‘disinformation’ (the Stalin and Soviet Russia’s role) intentionally thrown in by the ‘anonymous’ interviewee (Alfred O’Donnell of E.G. & G.) in Annie Jacobsen’s book. By the way, it is obvious by now that this book has become a very sensitive and emotional issue and has created an awkward situation especially among some of those who were directly involved at Area 51 and had sacrificed so much in fulfilling their patriotic assignments. “Instead of enjoying a great book that the DOD and DOE families can be proud of and share with their families, the aging Roadrunners are having to show up at Jacobsen’s book signings, not to promote her book, but to set the record straight and clear their names and legacy. 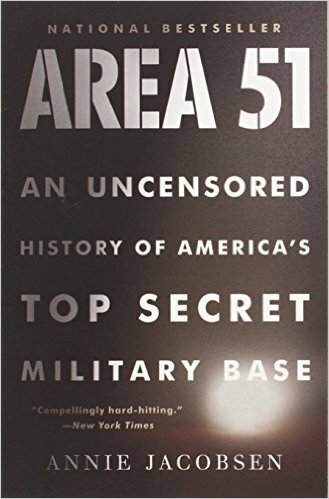 However, take away the final chapter, Area 51: An Uncensored History of America’s Top Secret Military Base is a great book that Annie Jacobsen put her heart and soul into and is CERTAINLY ONE THAT SHOULD BE READ”.